After working at an animal shelter for about 10 years, I realized I wanted to become a Veterinary Technician. 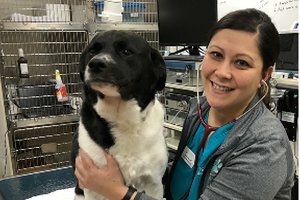 I did my research online and found that Pima Medical Institute's Veterinary Technician program had a good reputation, and their morning classes worked perfectly with my schedule. I was able to be a single mom, go to classes in the morning, and work in the afternoon. I had previous degrees that I didn't use, and I've always enjoyed learning, but PMI's program was very accelerated, I learned so much so fast. My instructors were great and gave us really good feedback. I realize I was a bit of a late bloomer in deciding to go back to school at age 34, but I'm so glad I did. During my Veterinary Assistant externship, I worked at Veterinary Specialty Center where I got great experience and a job. 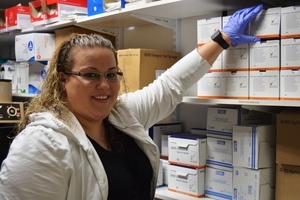 I was able to work while completing my Veterinary Technician program, and I recently became the internal medicine lead technician. I love my job in internal medicine, and I'm always learning. In fact, I am working towards my veterinary technician specialty license and even spend my vacation time going down into Mexico to participate in spay and neuter clinics. There are probably 20 of us PMI graduates at my work place. I have to say, it feels good to be surrounded by these graduates because I know they are well-trained and knowledgeable. This program really does set you up for success. In 2008 I lost my job as a director in early childhood development after twenty years in the field. The social service program I was working for got hit with a massive funding cut, and I came to the realization that no matter where you are in life, you sometimes have to learn to embrace the change. My change would be reinventing myself professionally. When I walked into Pima Medical Institute in January 2009, I wasn't sure if there was a specific program I would be interested in. My eventual decision to go into the Dental Assisting Program wouldn't have happened without the encouragement of the staff, and I would not be where I am today without them. Being a PMI alumnus makes me extremely proud, and I feel confident in my skills and what I learned from my instructors at Pima. In spite of our economic situation today, I was fortunate to be hired during my externship. I am a member of the PMI Advisory Board and continue to be a positive example to the externs that I come into contact with. 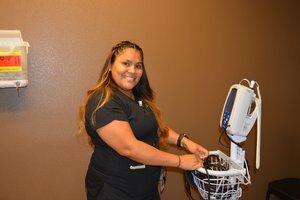 It is my desire to instill in them the highest expectations and standards we hold for them as Pima Medical graduates, and I know I will help enable them to be some of the best-trained dental assistants in the field. I fell in love with this field because of the transformation and satisfaction of each patient we handle. It gives me such joy every time I see one of our patients smile and I am proud to be a part of that. In 1995 my husband was stationed in Texas and I started a nursing program with a local college. After a year into my program, we were relocated to Germany. Continuing my education over there was a big challenge because there were no colleges close by. Eventually we got back to the states and I was ready to get back into school. I reached out to Pima Medical Institute with the determination to start as soon as possible. I enrolled into the Pharmacy Technology program with the goal of graduating with honors. I knew I had to work extra hard to reach my goal. After graduation, my son was getting sick often due to the weather here. His doctor recommended we move to a different climate to decrease the chances of more serious illnesses. We moved our family to North Carolina for a new beginning. 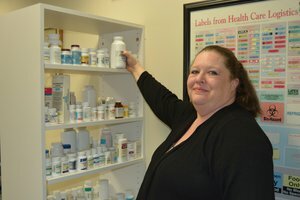 I started my Pharmacy Technician career with Walgreens where I worked for three months before being offered a position at a healthcare clinic. After gaining more experience, I was offered the Pharmacy Technician Management position. Later my family and I moved back to Washington and I contacted PMI to help me with job placement assistance. PMI offered me a position to be a substitute teacher and today, I am a permanent evening instructor for the Pharmacy Technician program and I couldn't be happier. I attended the Veterinary Assistant course at PMI and graduated from that program in 1995. I worked at my externship site, one of the emergency clinics in Tucson, for a little over a year. In 1996 I got a job at Feline Ltd. Cat Clinic and worked there full time until I began the Respiratory Program. I was fortunate to work part time with the cats while I was attending school. I am still employed there part time, working on Sundays and holidays. It has been an honor for me to work in a capacity helping animals. PMI helped me to attain this rewarding experience in Veterinary medicine, as well as my career goals in Respiratory medicine. I graduated from the Respiratory Therapy program with honors in March of 2001. I loved the program and the faculty at the Tucson campus. I am a registered Respiratory Therapist as well as a registered Polysomnography Technologist. I have been employed at the UMC Sleep Disorders Lab since March of 2000. I have a great job - thanks PMI! After completing my bachelor's degree in biology, I decided I wanted to become a Physician Assistant. However, I lacked the clinical hours needed to apply to PA school. 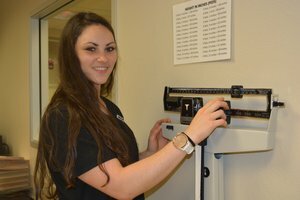 Therefore, I decided it would be a good idea to become a Medical Assistant, which would enable me to work and get my hands-on experience before taking the next step toward my PA career. After researching several schools, I found Pima Medical Institute offered the fastest program at the most reasonable price and I enrolled. Coming from the university setting to PMI's program was a big adjustment. I was used to attending different classes, for short amounts of time. 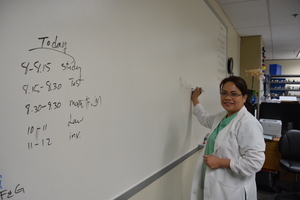 The MA program, however, required attendance every day for 4-5 hours a day. I learned so much! The program was more condensed and provided consistent hands-on training. I was assigned to a cardiologist's office for my externship where performing EKGs and taking accurate blood pressures were vital. This made me feel really good because I was confident with my experience practicing these skills in classes at PMI. I am currently working as a Medical Assistant at The Core Institute. It is a unique place, in that we have a team of orthopedic surgeons that work closely with our research team. We conduct research about prosthetics and consider the factors that impact their longevity. Ultimately, the surgeons incorporate research into surgery protocol. I am really enjoying my job and I've quickly become a valuable team member. My plan is to continue to work as an MA until I am able, to apply and be accepted, into a Physician Assistant program! My dad owned a dental lab so I grew up in the dental field. I wanted to become a dentist but thought that might be too ambitious for a first step, so I decided to become a dental hygienist. Pima Medical Institute accepted me into their program on my first application and it changed my life! My instructors were amazing! Their doors were always open and they were incredibly supportive. I enjoyed every minute of the program and before I even graduated, I had a number of job offers. I worked at my first office for about a year and got some great experience. I then transitioned to working for one of the top cosmetic dentists in the Pacific Northwest. 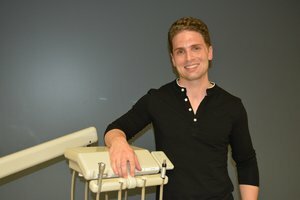 While working as a hygienist, I continued my education at PMI by enrolling in their online Bachelor of Science in Health Care Administration Program. I took the methodology my dentist was using, which was very different from general practices, and made that my capstone project for my bachelor's degree. When I graduated, my dentist promoted me to office manager and practice administrator. Since that time, I was promoted again, this time as head treatment coordinator. I have an amazing job that I love! Unlike most traditional university programs, PMI allows a student to complete their program of study and begin working in their field while they complete their bachelor degree online. Because of this, I was able to pay off all my student loans by the time I completed my bachelor's, and I graduated debt free! PMI was the best investment I have ever made.